8/12/11 - Acquisition - San Diego, Art Museum - The San Diego Museum has just disclosed a new acquisition : a painting by Anton Raphaël Mengs representing a bust portrait of the Infante Don Luis, known also as Luis Antonio de Borbón (1727-1785) in court dress, wearing the medals of the orders of the Golden Fleece, the Holy Spirit and Saint January (ill.). Estimated at between 150,000 and 200,000 pounds, the work had come up for auction at Christie’s London on 6 July 2011 without being sold. Mengs was invited to Spain in 1761 by king Charles III ; he lived in Madrid for about ten years where he produced some frescos for the royal palace and deployed his well known talents as a portrait artist at the Bourbon court. He painted Charles III of course, the king’s favorite likeness (despite the unflattering features illustrated with no concession...), as well as the future Charles IV, then Prince of Asturias. The portraits of the Infantes Antonio Pascual and Francisco Javier are similar to that of Don Luis, although the centring of the composition is larger : slightly turned to one side, a hat under their arm, they pose with a natural elegance underscored by the focus on their hands. Unlike the last two, the figure of Luis Antonio stands out from the neutral background, in a less theatrical presentation. Mengs executed another, more solemn portrait of him, of three-quarter size to the knees, his hand placed on a richly gilt and sculpted console, a contrast to the very bare background (Cleveland, Museum of Art). An artist of uneven quality, Rapahël Mengs was nonetheless considered a competitor to the portraitist Pompeo Batoni in Rome, or at least the only one worthy of consideration. Here also, he described the model faithfully, not seeking to idealize his features, no more harmonious than those of his royal brother, in a rather simple composition which seems to prefigure Goya’s works (for example, the three portraits residing at the National Gallery) ; it was, in fact, thanks to Mengs that the Spanish artist found work at the Royal Tapestry Factory of Santa Barbara. Goya also portrayed Don Luis and his family, around 1783 (Magnani-Rocca Foundation), capturing a private, not an official, moment and later produced the famous Portrait of the Countess of Chinchón, the daughter of Luis Antonio de Borbón. The last son of Philip V and the brother of Charles III, Don Luis was brought up from a very young age for a career in the church and was named Archbishop of Toledo and Cardinal Priest of Santa Maria della Scala when he was only eight years old. In 1754, he asked the king permission to return to secular life, a request which was granted on condition he stayed away from politics. 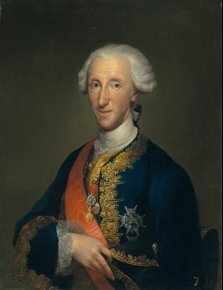 He became Count of Chinchón, lived outside of Madrid partly in exile, was a loyal patron and knowledgeable collector ; history tells us he died in his palace of Arenas de San Pedro in 1785.